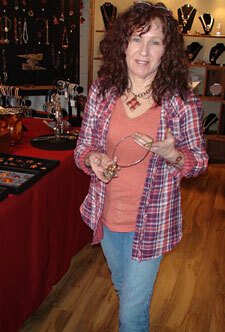 Sharon Delong in her retail store, SLD Designs. When she gets an idea for a design, she just goes with it. Her preference for flowers inspired her "Blooms from My Garden" line. Each piece is unique to her and every bloom is different. 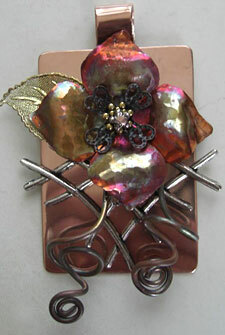 She hand-hammers and forms the metal flowers using copper, brass, nickel silver and sterling. Some creations include found objects like buttons or beads. Delong creates copper necklaces, bracelets, earrings and pins to match, all with her signature patina that gives her work an elegant antique look. She also guarantees the quality and workmanship of her jewelry and will repair or replace any piece she makes. Although established, Delong is always trying to learn more learn about the design process. She currently shares her craft teaching chain maille and other jewelry-making classes at Flower and Craft Warehouse in Blue Ball, PA and is a member of The Berks Chapter Guild of Craftsmen.